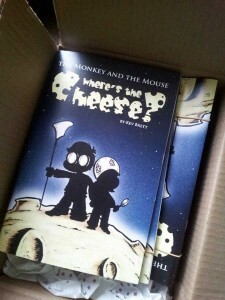 The Monkey and the Mouse » THE BOOKS!!!!! It’s been a long time I know and for that I apologise! 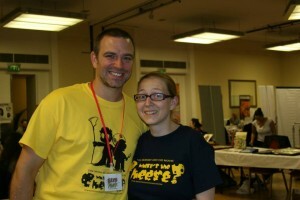 I’ve been fairly busy recently putting on Nerd Fest Comic Con which was AWESOME!! It was the premiere of a little book called ‘The Monkey and the Mouse: Where’s the Cheese?‘ and it was received well. I managed to get the book funded through kickstarter including many rewards such as badges, mugs, prints, t-shirts and even ANOTHER book, ‘Pretend We’re Having Fun‘ with over 160 TMTM strips in!! 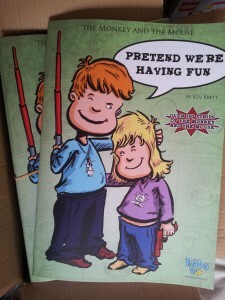 AND NOW you too can get your hands on the TMTM books!!!!! Pick up yourself a copy of the books here and thanks again for all your support!